Tissue from vomeronasal organ labeled with AGB and Alexa 488. 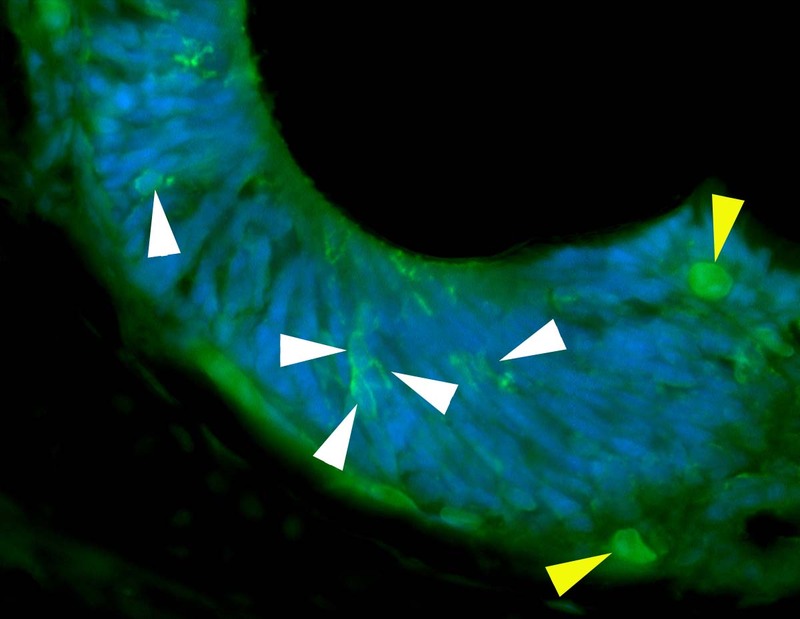 Labeled cells were mapped and counted throughout the entire vomeronasal organ. 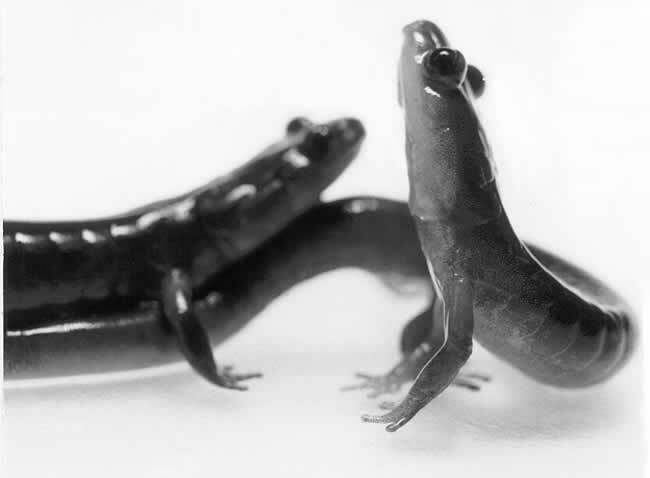 Male plethodontid salamanders utilize proteinaceous pheromones during courtship to increase the female's receptivity. The vomeronasal system plays an extensive role in the processing of pheromonal information. 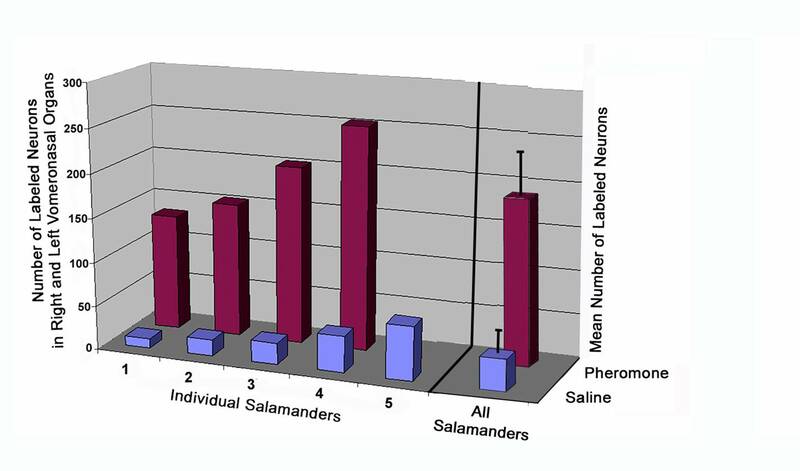 VOMERONASAL NEURONS We used neuronal uptake of agmatine as an indicator of the responsiveness of vomeronasal neurons in female plethodontid salamanders (Plethodon shermani) to male pheromones. 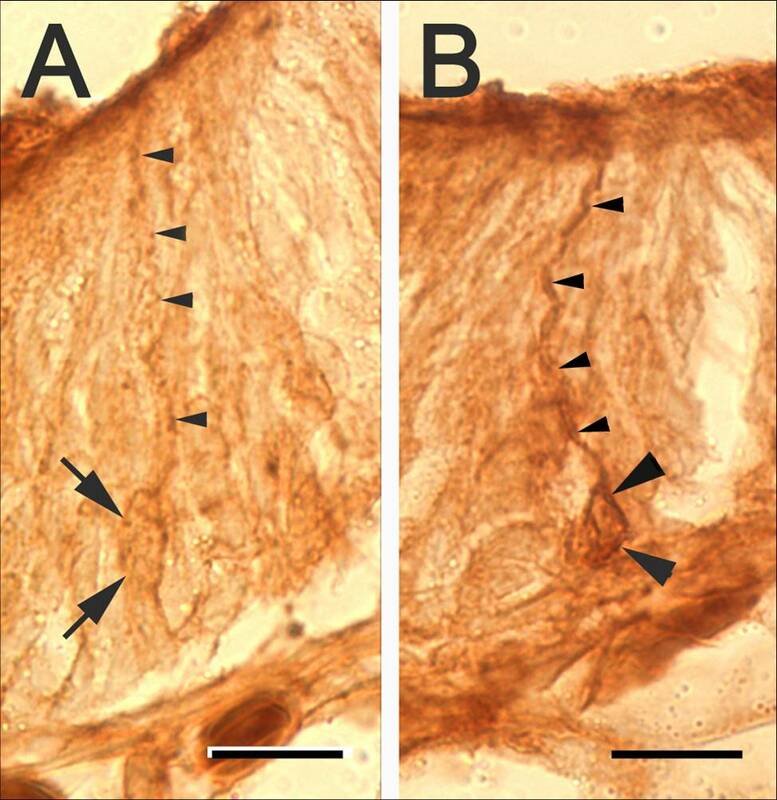 Vomeronasal neurons from female Plethodon shermani were examined following exposure to male pheromone or saline placed on the nares. Agmatine was used in conjunction with the pheromone to enable immunocytochemical visualization of chemosensory neurons that were activated by the pheromone. 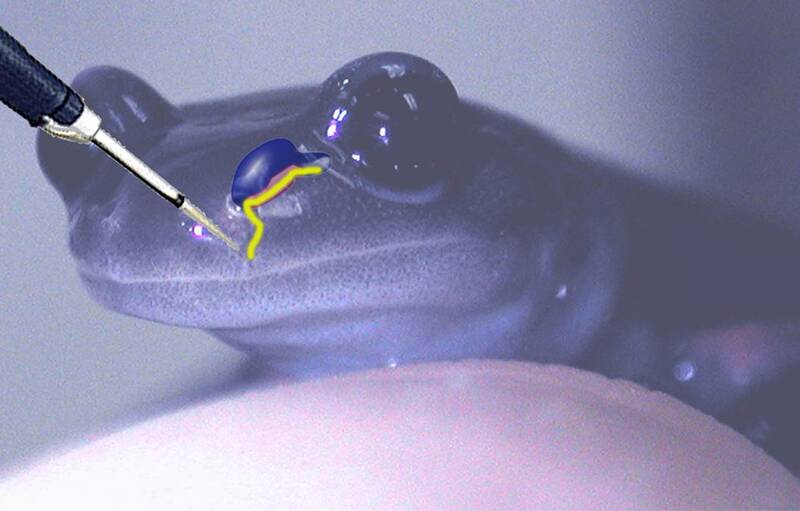 Whole pheromone extract from male mental gland or saline (each containing 3 mM AGB) was applied to female plethodon nares (n = 5 for each condition) for 45 minutes (2 microliter/2 min). Females were killed by decapitation and heads were fixed in 4% paraformaldehyde-2.5% glutaraldehyde overnight. Tissue was processed for cryostat sectioning (20 m), and standard immunocytochemical procedures were used to label AGB in tissue with DAB and Alexa 488. 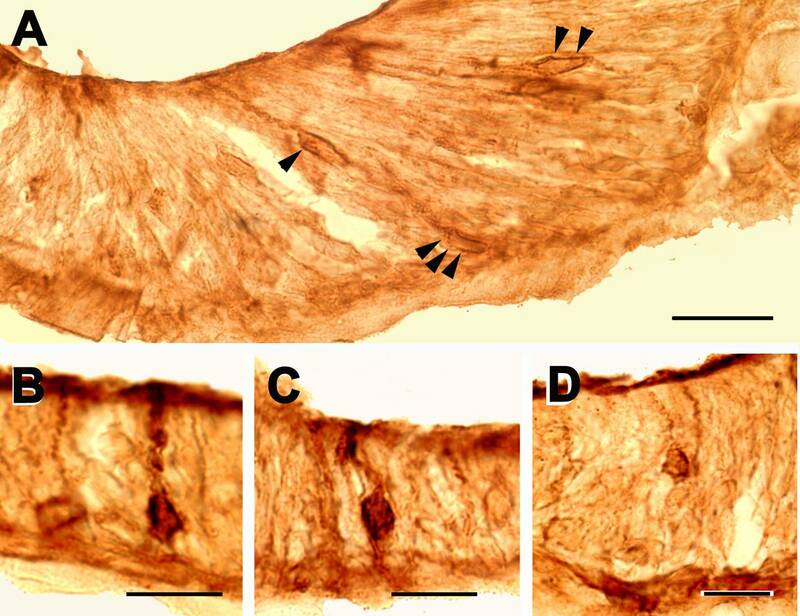 Labeled cells were mapped and counted throughout the entire vomeronasal organ. 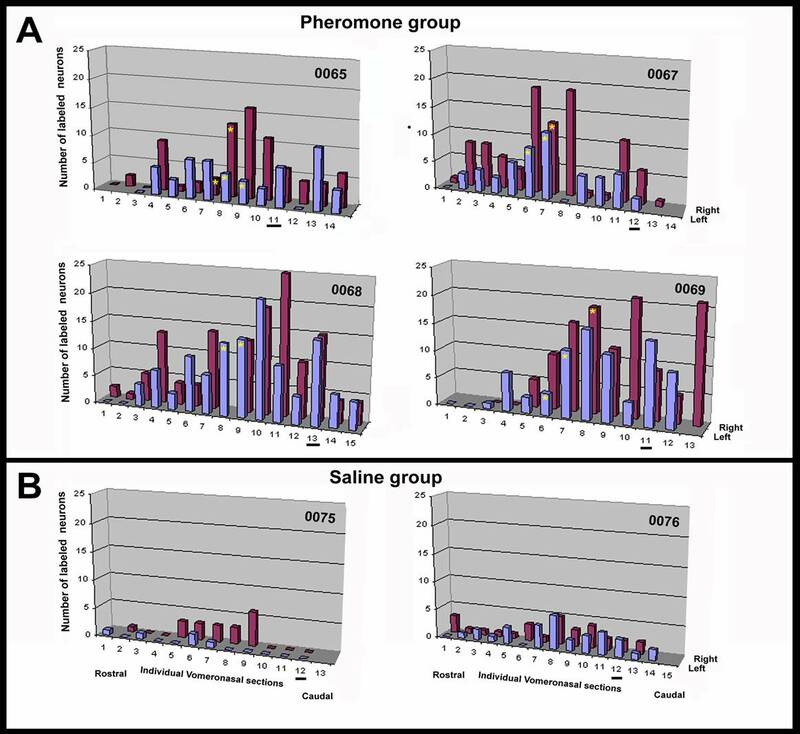 Olfactory neurons exposed to pheromone or saline, and vomeronasal neurons exposed to saline did not demonstrate significant labeling. A population of vomeronasal neurons was intensely labeled following exposure to the pheromone. This study demonstrates that a specific population of vomeronasal neurons in a female plethodontid salamander is responsible for transmitting pheromonal information to the brain to produce modifications in behavior. BRAIN PATHWAYS CNS response to courtship pheromones in that species using immunocytochemical detection of the immediate-early gene product c-Fos (Laberge et al. 2008). 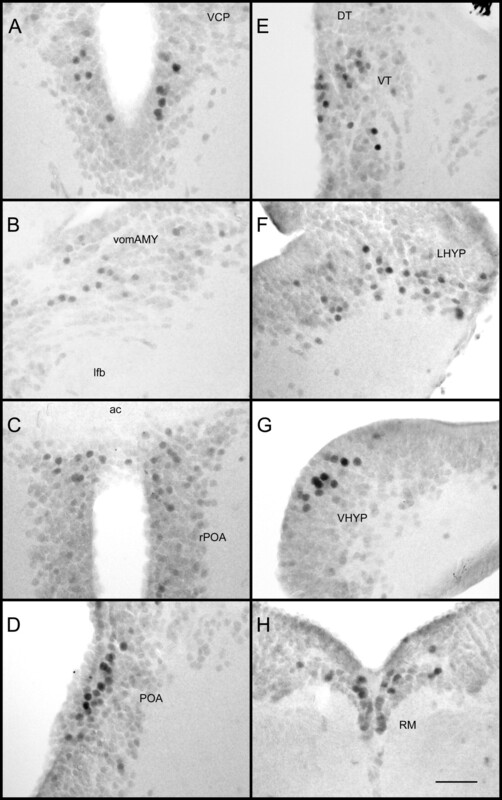 Application of a male gland extract to females activated Fos-like immunolabeling in: (1) the extended vomeronasal amygdala of the accessory olfactory system, (2) the preoptic area and ventromedial hypothalamus, regions of the brain known to mediate reproductive responses in vertebrates; and (3) the raphe median, possibly indicating a serotonergic activation. 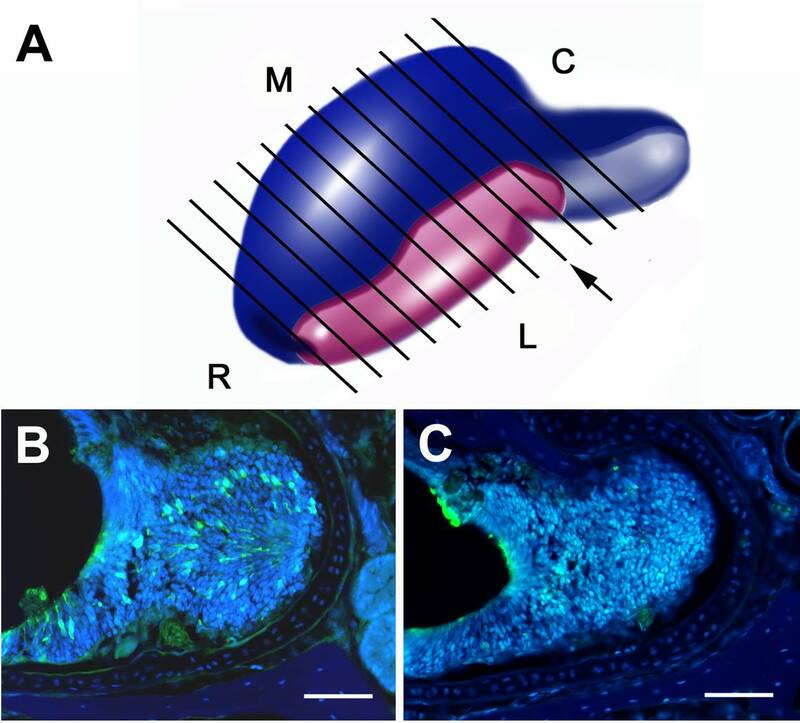 Application of individual purified courtship pheromone proteins resulted in increases in Fos-like labeling in some of the regions activated by the complete submandibular gland extract, but the pattern of labeling was not as clear as that of the complete extract. Unlike other known vertebrate reproductive pheromones, courtship pheromones in P. shermani were effective only at a high concentration. This could result from the particular mode of pheromone transfer in that species, which involves sustained direct contact between male and female. It is concluded that salamander courtship pheromones exert their influence on behavior through the vomeronasal pathway and its direct projections to the preoptic and hypothalamic regions.